On September 10th, join TELL and others around the world in taking action to combat suicides in our communities and focus public attention on the unacceptable burden and costs of lives lost every day. This year, the 2016 theme of World Suicide Prevention Day is “Connect, Communicate, Care,” symbolized by the launch of the hand-holding awareness ribbon. Care is the final step, for anyone thinking about killing themselves we need to let them know they are important, and care enough that suicide prevention becomes a priority in our community, ensuring policy-makers and everyone treat it as such. Every 40 seconds someone in the world takes their life by suicide, and every two minutes a young person. It is vital for everyone to recognize that suicidal behavior is not a sign that someone wants to die, but is a scream for help, and an illness that is not being treated. It is time to stop and look at those around us, to hear the cries of help, to let those struggling know they are important, it is not hopeless, they are not a failure, that we care, that help is available and recovery possible. TELL is proud to announce our 2016 Talkie Walkie is made possible with support from Morgan Stanley again this year. You can show your support by joining one our our walks in Tokyo, Osaka, Kyoto or Kobe. Or you can hold your own walk for TELL anywhere in Japan, and help raise important funds to get our Lifeline 24/7. 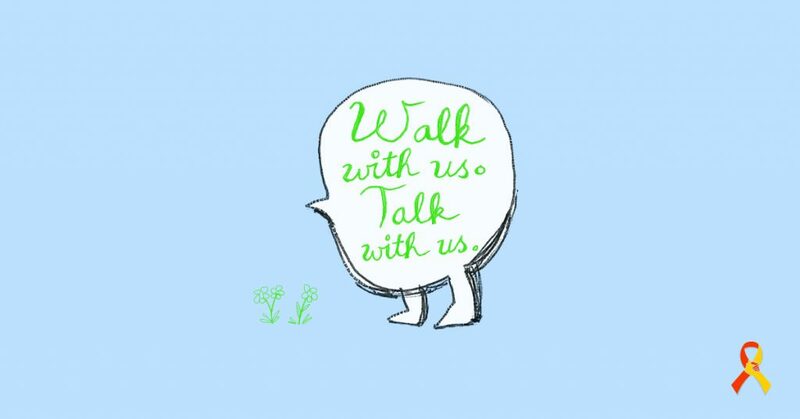 Participants will each receive a TELL Talkie Walkie tote bag, that we ask you to gather signatures on the day as you make connections and start conversations along your walk.